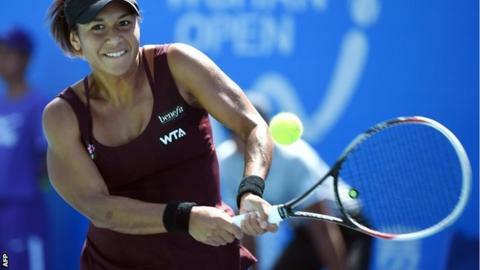 British number one Heather Watson suffered a first-round defeat at the Wuhan Open in China, beaten 7-5 6-4 by world number 12 Sara Errani of Italy. The 22-year-old Briton was a wildcard in the event following the retirement last week of China's number one Li Na. In the first meeting between the pair, Errani took a close opening set before Watson went 4-0 ahead in the second. But 11th seed Errani won six successive games against the world number 47 to seal victory in one hour 29 minutes. Fourth seed Maria Sharapova, who had a bye in round one, beat fellow Russian Svetlana Kuznetsova 3-6 6-2 6-2 to reach the third round, while France's Caroline Garcia upset Polish fifth seed Agnieszka Radwanska 3-6 7-6 (7-4) 7-6 (9-7). Top seeds Serena Williams and Simona Halep begin their campaigns on Tuesday. "Today didn't go how I wanted it to," said Watson, who will play in the doubles alongside American Alison Riske. "I played well in patches but didn't keep it consistent throughout. It was a very up and down match. "She made a lot of balls, she moves well and she stuck in the match the whole way through, and I think that's what won it for her in the end." Watson reached a career high of 39 in the world last year before being struck by glandular fever, but she moved back into the top 50 after reaching the last 16 of the Montreal Open in August. She has now lost in the opening round of three consecutive events, following defeats by world number 80 Sorana Cirstea at the US Open and qualifier Nicole Gibbs, the world number 101, at last week's Korea Open.